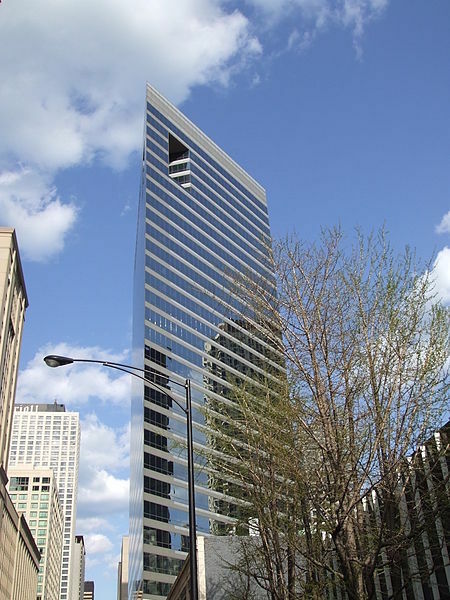 Headquarters of the American Medical Association in Chicago, IL. Wikimedia Commons. While a majority of the public, and an increasing number of politicians, support a Medicare-for-All health care system, any serious proposal will face major hurdles due to the lobbying power of insurers, big pharma and other industries that are deeply invested in the status quo, according to a new report by Public Citizen. Originally published at the Sanders Institute. By now, we’ve all heard the talking points, and it can be incredibly difficult to differentiate the facts from the hype. "Don't other countries with single payer experience really long wait times?" "Why should we expand Medicare? Don't a lot of people have negative experiences with it?" "Why should I pay for someone else's healthcare?" Over the course of recent months, [the Sanders Institute has] received hundreds of questions like these from our subscribers, followers, and other members of our community. These are questions from people who want to learn about the issue and how they can make a difference to move this country forward. 1. How does healthcare in the United States compare to other developed countries? This week President Trump put out an op-ed calling Medicare for All a “threat to seniors” that would “end Medicare as we know it and take away benefits that seniors have paid for their entire lives.” I’ve been watching conservatives try to scare seniors into opposing good reforms my whole adult life, and now that I am a senior (a year older than Mr. Trump), I find the tactic even more offensive. The truth is that Medicare is a decent program, but it has a lot of room for improvement—which is exactly what Medicare For All does. I have been on Medicare for eight years. In addition to Part A, which everyone is automatically enrolled in at age 65, I am enrolled in Part B (which is also automatic unless you intentionally opt out). Part B requires that I pay a premium, which is deducted from my Social Security benefits. Beyond this coverage, I also purchase supplemental insurance through a private insurance company to help with costs not covered by Parts A and B, as well as separate prescription drug coverage (Medicare Part D), also through a private insurance company. Originally appeared August 16, 2018 in The Week. 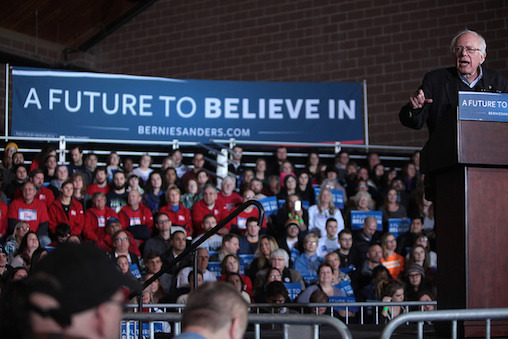 Senator Bernie Sanders speaking with supporters at a campaign rally in Des Moines, Iowa, January 2016. Photo by Gage Skidmore. Medicare-for-all is getting some real momentum behind it, with several more supporters winning congressional primaries [in August]. The medical industry — drug companies, insurance companies, medical providers, and others — has thus been gearing up to preserve the fat profits they enjoy under the horrendous status quo. They've formed a group called The Partnership for America's Health Care Future (PAHCF) to run a propaganda campaign against universal health care. What does democratic socialism mean? Originally appeared on Vox, on August 1, 2018. Medicare for All rally, Los Angeles, February 2017. Photo by Molly Adams. 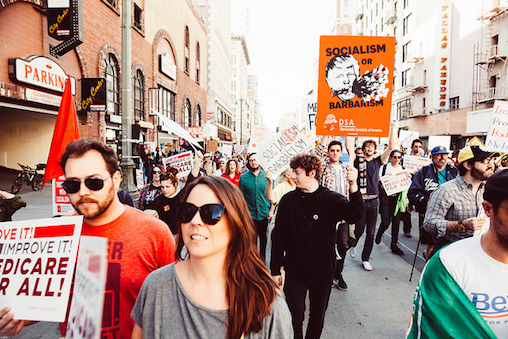 As part of Vox's First Person series of personal essays, East Bay DSA member Meagan Day defined democratic socialism with authority as a DSA member, in the midst of so many articles this past summer attempting to explain the movement away as something none too radical. Where does our Medicare for All campaign fall into her outlook? Winning [Medicare for All] in the US would be an enormous relief to the millions of Americans who, even with insurance, find themselves stymied by claims denials and crushed by medical debt. Many progressives and an increasing number of centrist liberals — hell, even a few Trump voters — want the private insurance industry to be replaced by a single comprehensive public insurance program, one we all pay into with our taxes to relieve everyone of financial stress in times of illness. We want that too. Meagan Day is a staff writer at Jacobin magazine and a member of the East Bay DSA. 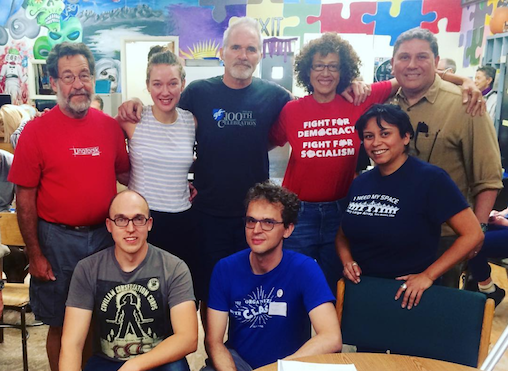 About a dozen Seattle Democratic Socialists of America members turned out on Sunday, August 14, 2018 to talk to their South Seattle neighbors about healthcare. 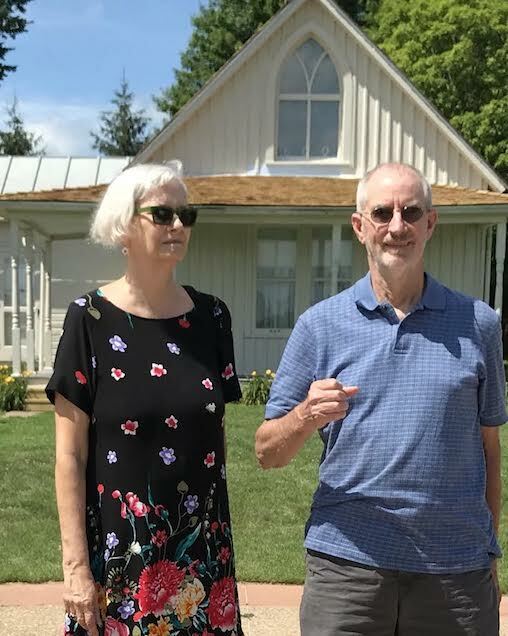 Afterwards, they headed to a panel discussion at a nearby library to hear about how and why the American healthcare system is so broken, and most importantly, how we can organize to change it. 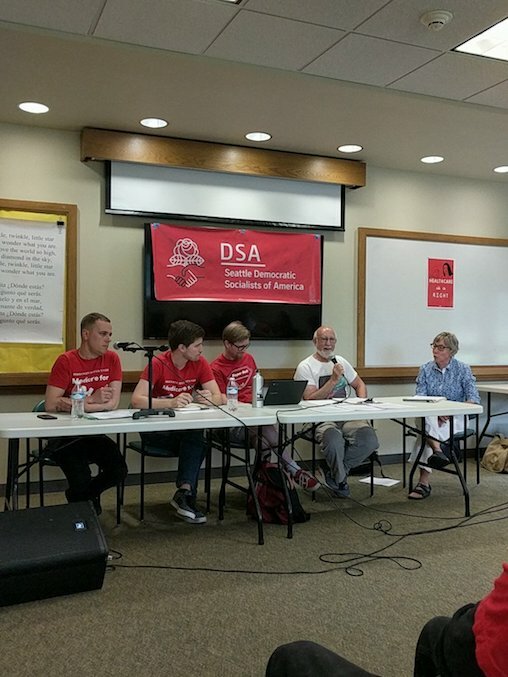 Our speakers, from left to right: Paul and Andrej of Seattle DSA, Stan Strasner of Seattle's Healthcare for Subs campaign, Jim Squire of Physicians for a National Health Plan, and Marti Schmidt of the National Lawyers Guild. Seattle's efforts were their part of the Weekend of Action, a national effort organized by the Democratic Socialists for Medicare for All campaign. 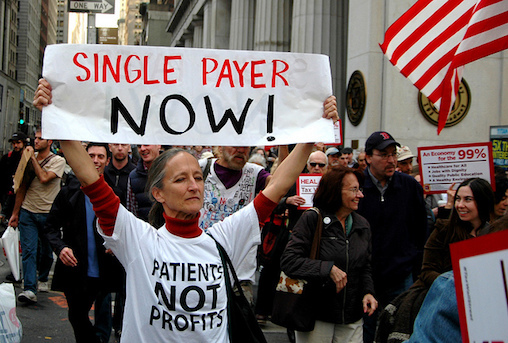 The campaign seeks to bring a universal, single-payer healthcare program to the United States, which would provide comprehensive healthcare to all American residents free at the point of service. 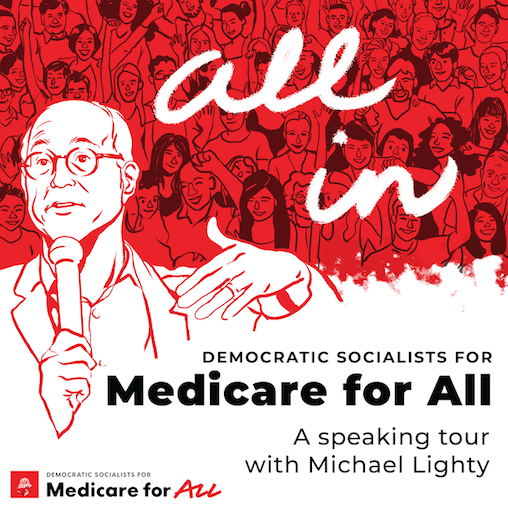 DSA’s Democratic Socialists for Medicare for All is an ongoing campaign to make single-payer healthcare a reality. "A universal program like Medicare for All means no gaps, no loopholes...no wedge where people can be left out." -Andrej Markovčič of Seattle DSA. Last year, New Mexican state legislators nearly passed the nation’s first state-based universal health care program. The New Mexico Health Security Act, a bill which will be introduced again during 2019’s legislative session, would establish a single health plan covering around 1,800,000 New Mexicans. The Health Security Plan would cover people regardless of their income, employment, citizenship status, gender, and current health and would be administered by a public body comprised of people from all over the state. This commission’s decisions would be discussed and made in open meetings, and so would be accountable to grassroots demands. The New Mexico Health Security Act would democratize health care and weaken capitalists’ power over workers. 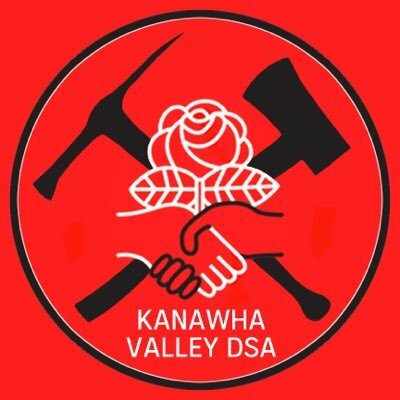 This August, West Virginia’s three main DSA chapters kicked off our first-ever joint campaign, focusing on the struggle to fund the Public Employees Insurance Agency (PEIA) in our state and its connection to our larger national demand for Medicare for All. Meeting in Charleston, the state's capitol, we brought together members from Kanawha Valley, North Central West Virginia and the Eastern Panhandle, where we spent two days getting to know each other and strategizing for this statewide campaign. We held training on canvassing, power-mapping, developing a political education program for our members and bird-dogging candidates and established a committee to continue inter-chapter communication on the campaign going forward. In our state, we just witnessed one of the most successful wildcat strikes of the last 50 years of US history. 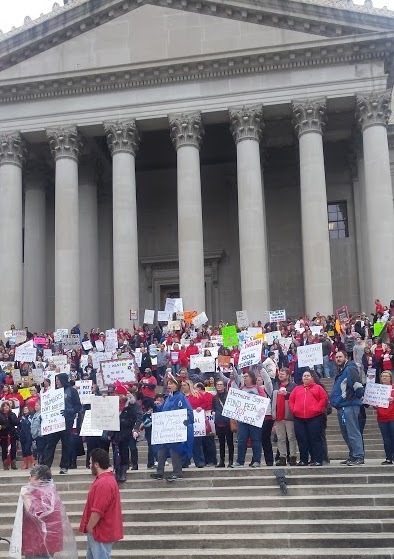 State school employees won a 5% wage increase not only for themselves, but for all state employees – demonstrating the power and potential of working people to win ambitious demands from the state. We knew, following this strike, that it was time to meet up and work to grow our DSA chapters together, seizing on the moment of increased worker militancy.